Place the heavy cream in a medium saucepan set over medium heat, stirring occasionally until it comes to a simmer. Add blue cheese and stir until melted. Bring back to a simmer. In a small bowl dissolve cornstarch in water and whisk into blue cheese mixture until thickened and add lemon juice. Remove from heat and transfer to a large bowl. Cut the bacon slices into 3/4” pieces and place in a large sauté pan set over medium heat. Cook the bacon until desired doneness, about 20 minutes. Remove from heat and drain on paper towel. Add the bacon, horseradish and ¼ cup parsley to the cream mixture and season to taste with salt and pepper. Cook the pasta in salted boiling water until just starting to turn al dente and drain. Be careful not to overcook as it will continue to cook in the oven. Add the pasta to the cream mixture and stir until combined, tasting again for seasoning. 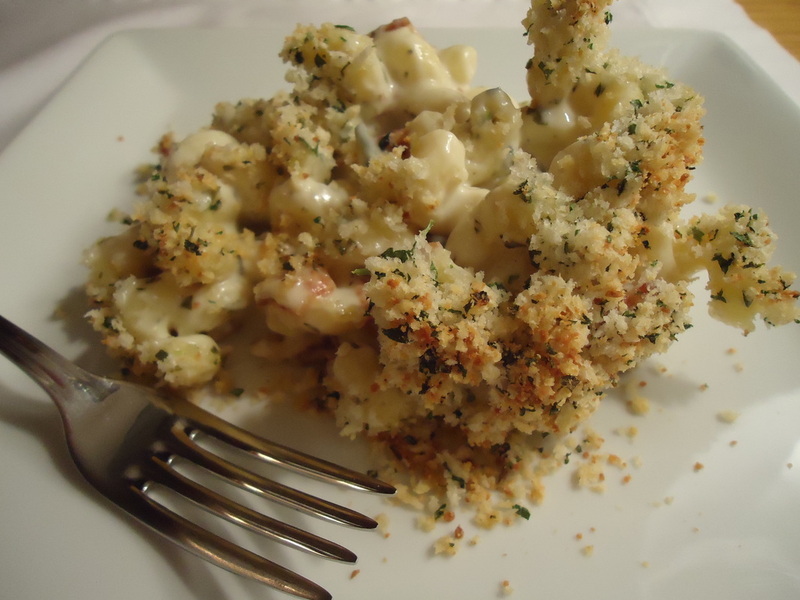 In a separate bowl, combine breadcrumbs, parmesan cheese and remaining parsley. Pour the pasta mixture into an oven safe dish and cover with the breadcrumb mixture. Bake at 350 degrees for 30 minutes.